Cor, a slap up feed of comics links! In the wake of the rumoured demise of The Dandy, artist Jamie Smart writes about the necessity of All-ages comics and how to make them work. Bonus links: The origins of new British weekly kids comic, The Phoenix. Al Ewing on that most British weekly comicsy of institutions: The readers voice. Tips for aspiring comics creators. Imagine an overstressed parent of a young child wanting to keep their kid busy for a while. That's the person you're trying to convince to buy the thing. 1) Make 'em big and/or cheap. Something that costs $4 and is 24 pages long is a really poor investment as a child distracter. Either cut the cost or multiply the page count. Print it on recycled newsprint. This thing isn't going in a long box, it's going to be literally chewed. Consider reprinting old comics at extremely low prices. You think a dirt-cheap paperback booklet of Lee/Ditko Spider-Man #1-10 wouldn't sell? Play by drug dealer rules: first one's free, kids. A busy parent is probably not going to visit a comic book store but absolutely will visit a grocery store. I'm not seeing Spider-Man shelved next to Cosmo at the checkout. Why? Archie Comics should be considered the model on both points. They're terrible comics as far as I'm concerned but you can buy a nice fat booklet of them at a reasonable price in the checkout aisle of every grocery store, where they are bought in large numbers for lack of competition. Oh wow, yes, commas are important and would really have helped this sentence. I was confused about why and how Smart was rumored to be dead but still writing about comics. I was confused about why and how Smart was rumored to be dead but still writing about comics. I just assumed he'd read enough X-Men that death had become a mild scheduling inconvenience. I used to read Nutty when I was a kid. 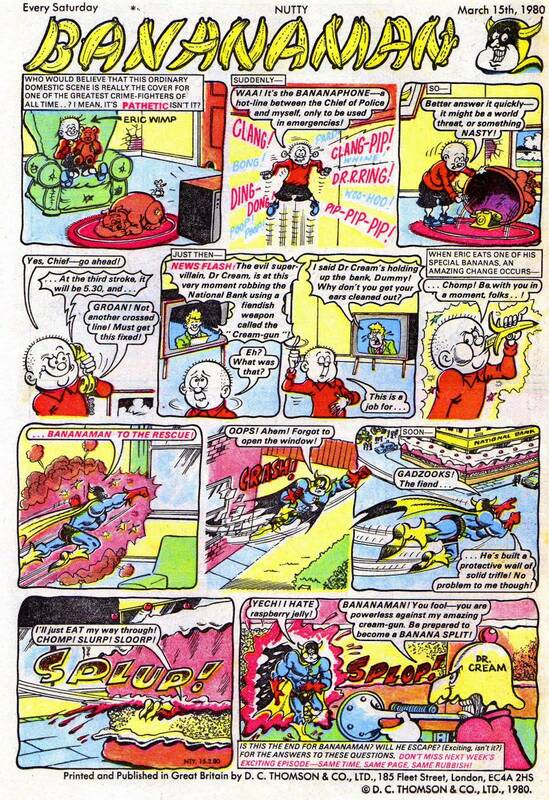 It was the comic where Bananaman started, and (to me at the time) it seemed to have a genuinely silly and irreverent attitude, kind of like Danger Mouse which was also around at the time. In contrast, whenever I looked at my friends copies of The Beano or The Dandy, it just seemed to be very repetitive stories, with the sort of jokes or puns you'd get in a christmas cracker. Jokes that were a grown-ups idea of what kids would find funny, rather than what kids would actually find funny. Which brings me to my point: I don't really think the Dandy or the Beano were ever that good, but kids read them because there wasn't much else of interest to read in 1980 if you were 8 years old. So everyone remembers them now with a nostalgic glow, but at the time they were pretty lame. These days kids have got a lot more options. Why bother reading about Dennis the Menace getting slippered yet again when you can send lolcats to your mates, build a city in Minecraft, watch cats roller skating on youtube, play lego-star-wars computer games that have 10 times the wit and inventiveness that 1980s comics had, or read some of the tons of decent kids fiction that is around. Oh wow, when I was a little kid (early '70s) my grandmother would send me care packages of Dandy and Beano regularly, and at Christmas she'd include the annual of each along with Oor Wullie and The Broons. When I got a little older I started to get The Victor and The Hotspur. I loved them all. There were no comics like them on this side of the pond (and I didnt care for superhero stuff). I'm amazed The Dandy still has some of the same characters. Ditto to everything rocket88 said. My Aunt Gracie sent us comic packages from Belfast, usually rolled into a log sized parcel. For better or worse, those comics had a HUGE influence on the way I draw. For the second half of every summer holiday, I'd lay on the basement floor with pencils and a giant doodle pad copying Beanos, Dandys & Toppers (also Cracked and Mad magazine). I used to read all sorts of comics when I was younger, Disney / Mickey magazine, Whizzer and Chips, Whoopee, Nutty and eventually 2000AD. The Beano and the Dandy were always boring and like memebake said, once better comics came along that clearly showed. Insiders say the 1950s to 1960s were. Judging by the reprints I agree. There was a brief golden age where Davy Law (early Dennis), Leo Baxendale (Bash St Kids etc), and Ken Reid (Jonah etc.) were at their anarchic peak and the Beano sold in the millions. But yea, from the late 1960s we've had a period of long decline. Still mild fun in the 1970s, bought for nostalgia in the 1980s, and only surviving the 1990s due to desperate and often painful attempts to keep their heads above water. Though the illustrations could be (and often were) sublime, both in the pre-60s (I'd recommend Dudley D. Watkins, pregenitor of The Broons, Oor Wullie and Lord Snooty and his Pals out of them) and later (Baxendale in particular for me), the stories were intensely formulaic and repetitive. When I was younger this was a feature rather than a bug. Viz was set up specifically to parody the form - child with unusual characteristics uses those characteristics to solve a problem much same the way they did last week. The best of them - or at least the one I found most exciting when I was a kid - was Monster Fun, which had heavy Baxendale input. I also liked the back cover of Cheeky (each week, it was designed to be camouflaged in a different place, so it looked like a desk top, for example). However, I'll always have a jaded relationship with them, as I've always been one of life's Weedy Walters, rather than a Dennis the Menace. I know some of the new comics makers (who've worked on The nuDandy and The Phoenix) a little bit and really admire their passion and enthusiasm. If they can make kids comics work as a business proposition, what will come out of it will be really, really good. My little sister read Nutty, I read Buster. I never really got into the Beano or the Dandy, seemed a bit old-fashioned somehow. But yeah, this was at a time with 3 channels of TV, no video, no computers, no internet. Comics will have a tough time in an age when kids have iPads, unless they have an e-version with some very cunning monetization tactics. I imagine Walter grew up into a waspish camp gay guy in a musty bow-tie. I always read Buster, and my sister read Whizzer And Chips, then we'd swap once we'd both finished. The occasional Dandy, Beano or Bunty crossed our paths and got read by both of us too. Trying not to turn this into a comment where I just list favourite comics and strips. Faceache was classic though *scrunge*. Anyway, I read a couple of the links. 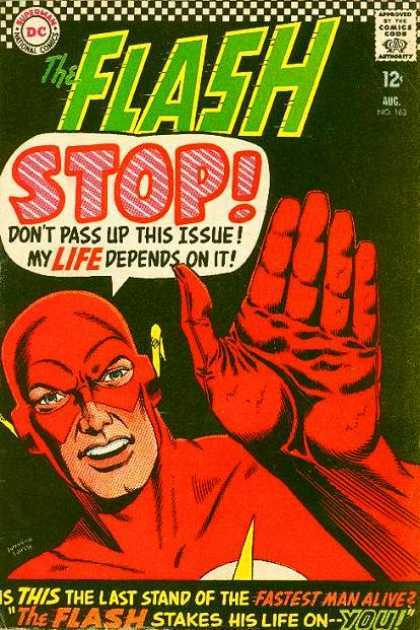 Particularly liked the piece about the reader's voice, which also made me think of Grant Morrison's famous favourite Flash cover. I wonder if early familiarity with this sort of direct address from a younger age is what made it appeal to him. Heard/read a few interviews over the years, but can't remember how he started reading comics. Also, something I remember reading online (maybe at the mindlessones.com?) which came as a revelation despite being really obvious is that part of the reason for the incessant foregrounding of food in so many of the strips is probably wartime and post-war rationing at the time when so many of the tropes and characters were established. As I said above, I think these comics thrived for lack of anything else for kids to do. It will be hard to make such repetitive, plotted-by-numbers fare do well in the 21st century. But there is something very compelling about the comic strip. You have a simple character, some simple scenarios, some sort of turnaround ending. Its like training-wheels for understanding character and plot in stories. Perhaps that why when I was about 8 me and my friends were obsessed with drawing our own comics - inventing characters and then coming up with plots. But this was in the age when photcopiers were rare pieces of hi-tech office equipment - all of our hard work was destined to be hand made one-offs that we passed around but could not distribute. Of course thats not the case anymore. So why expect kids to buy comics when they can make their own just as easily? The true successor to the Dandy and Beano from the 70s and 80s is not some digital web site version of the old comics. Its the homemade comics that (you can bet) are being drawn, scanned, printed and passed around by youngsters all over the world. The best of them - or at least the one I found most exciting when I was a kid - was Monster Fun, which had heavy Baxendale input. Seconded for Monster Fun, which seems to have dropped from the collective memory, but for me was easily - easily - the superior weekly, with often gorgeous artwork and what felt like a genuinely subversive streak. Its merger with the tedious Buster opened a period of mourning for my nine-year-old self which only ended with the following year's emergence of 2000AD. It's a myth though to think that the 'young' comics audience has somehow died away completely: I buy books for a living, and the exponential rise of manga for teens over the past decade in the UK market has been remarkable: as a result, I do not believe that young people are having any real issues in understanding comics as a medium. The problem I feel is trying to ascribe nostalgic delivery systems (i.e. the weekly, 32 page comic) to a contemporary audience who are used to entertainment being far more immersive and which represents real value for money. Adopting the physical manga size/page count and delivering tales on a (say) quarterly basis for under a tenner strikes me as a real opportunity that has yet to be exploited in the UK. If the approach was canny and knowing enough, with the right distribution, the final product could find a home in both bookstores and newstands alike. The Phoenix Presents: Jamie Smart on Bunny Vs Monkey!